Parental Ideas: Red Sox Kid Nation is back for 2019! Red Sox Kid Nation is back for 2019! 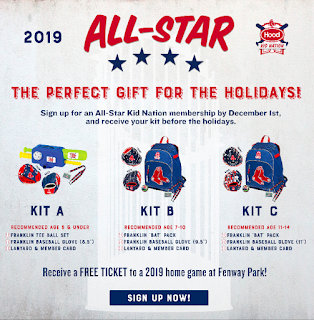 On the heels of the historic Red Sox World Series Championship, the Red Sox Kid Nation program for 2019 launched today and will again include Rookie (free) and All-Star (paid) memberships for the youngest fans of Red Sox Nation. In addition to the above, the All-Star membership includes one of three membership kits with a membership card and lanyard, baseball globe and either tee-ball set or backpack (pictured above and to the right). More information on the program is available at redsox.com/kidnation. NOTE: We are providing this information because we're members of the Red Sox Parents blogger initiative. From time to time we do get to participate in fun Red Sox related activities and share that information with you, our readers. No compensation was provided for this post and all opinions are our own.